Alhamdulillah, praise be to Allah Subahanhu Wata’ala, for it is with His blessings that we have another opportunity to experience the goodness and spirituality of Ramadan. As the Holy Month draws to a close, I trust our Muslim colleagues are taking the opportunity to make the most of Ramadan’s remaining days to increase good deeds and to make positive changes all around us. Changes and improvements begin with an intention or “niat”, with true and sincere intentions being the cornerstone of our efforts towards achieving our goals. The feat of fasting and abstinence throughout Ramadan shows that a sincere intention followed by responsible actions are key in achieving success. This reminder is especially important as we endeavour through the trying times in our industry whilst striking a balance to deliver a multitude of responsibilities. These include our duty to the Company, Country, society and last but not least, our beloved family, underscored by our faith in the Almighty. Let us also make full use of the festivities during Syawal to reunite, rekindle and strengthen ties with families and friends. Take this opportunity to express our appreciation and gratitude, and share our time with those who have sacrificed much for us. The shared moments and memories with our loved ones are one of the most precious gifts of Aidilfitri. 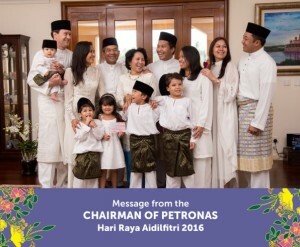 My family joins me in wishing everyone Selamat Hari Raya Aidilfitri, Mohon Maaf Zahir dan Batin; and wherever you’re headed, safe travels.